One sunny afternoon, as I was shopping for a friend's birthday present, I decided to venture a little bit further into East Oxford and stumbled upon The Retro Room. As you enter the shop, it is hard to anticipate the two additional basement rooms with rails and rails of amazing clothes at extremely reasonable prices. Room one offers vintage shoes, hats and jewellery and room two combines second-hand highstreet pieces with pre-loved designer, which is sooooooo exciting for anyone who loves clothes as much as I do. One moment I was admiring a Topshop jumpsuit, and just next to it found an Alexander Mcqueen gown in pristine condition that truly made my heart start racing. Room 3, The Retro Room, is where unique vintage pieces are kept. My mind was blown by Escada Suits, 60s paisley sets and incredible beaded numbers. I bought a completely bizarre blue silk suit with a feather trim by cult Oxford designer Annabelinda. Why had I never heard of this shop before? The shop was a real dream come true for me and I couldn’t understand why I, or anyone I had spoken to about it, hadn't heard of it. Then, I had a little Google search and realised why. There was no website, an abandoned Facebook page and the Google business page was all over the place. Audrey didn’t have the same web marketing budget as the large chain vintage shops do, nor did she have the time to regularly update and market her business online successfully. So, we put together a cost and time effective strategy to give the Retro Room’s web presence an extreme makeover. A logo is important, so that’s where we started. Looking to the shop for inspiration, plus examples of typography that Audrey liked, I made a simple logo that does the job. Retro, eye-catching and easy to put on stuff. Next, a photoshoot. I made sure to take photos of the shop exterior, interior, some close up shots of materials that could be used as banner images on the website, and photograph some eye catching pieces that would do well on social media. Audrey doesn’t like to have her photo taken and that’s fair enough, neither do I! The website’s main function is to provide people with a place to find out more information about the shop, which is why we decided to make it a one-pager. No e-commerce or blogs yet, but the beauty of Squarespace is that if we do decide to add more pages later, it will only take an hour or so to build now that the structure of the site is in place. 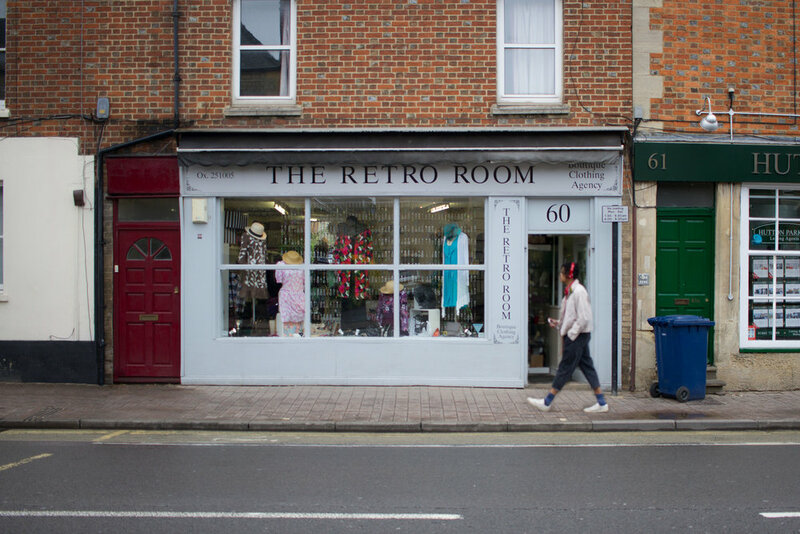 The Retro Room’s concept isn't very straightforward: three rooms, one is vintage clothes, the rest are high-end high street and designer. It was important to get this message across on the website, as the shop’s name might lead people to think that the shop is a lot smaller than it is. Finally, a form! A lot of the stock that is in the Retro Room is brought in by customers and Audrey splits the profit with them 50/50. Customers needed to understand that stock is only kept for a month and it has to be in great condition, so a form is a perfect way of getting people to read the terms and conditions of selling. With all of these resources in place, it was easy to then begin sorting out the Facebook page, setting up an Instagram account, and updating the google business page. So far, we are hearing lovely things from the Oxford community and beyond and our social engagement is on a steady incline. Hooray! If this story sounds like you and you would like help getting online, please don’t hesitate to get in touch!